On the 1st Friday of each month the “School Store” is open with items available for purchase to the students. A table is set up outside the cafeteria during lunch times and after eating, students are allowed to peruse and shop for various items. Folder, pencils, erasers, “grippies,” bookmarks and the like are available. Note: This service is referred to as the “School Store” in order to differentiate it from the “Spirit Wear” sale where items of clothing (Tshirts, flannel pants, sweatshirts, etc.) 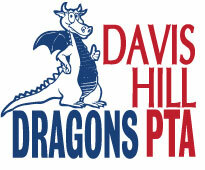 with the Davis Hill logo are available for purchase at separate times.